Out of home commands a small but growing slice of total media spending in the U.S. One might think its share would be larger based on its reach and acceptance by consumers. FEPE International, an international trade organization for the out-of-home industry, recently commissioned a study that found 24 percent of consumers say OOH is the “most trustworthy” media type. That was second only to TV, which came in at 28 percent. Print was third at 22 percent, while online advertising got a scant 3 percent. The study also found 46 percent of consumers find TV features the most memorable ads, followed again by OOH (34 percent) and print (7 percent). The survey was conducted by Future Foundation and included respondents from the UK, Germany, Spain, Turkey, Brazil and South Africa. Among U.S. residents age 18 and older, 89 percent have used motorized transportation including cars, trucks, taxis and buses, according to an Arbitron study commissioned by Lamar Advertising, giving those people the opportunity to see OOH ads such as billboards. The study also found that U.S. travelers spend an average of 20 hours, 16 minutes per week driving or riding in a vehicle, as well as 169 miles on the road each week. Many of those riders remember seeing out-of-home ads. Sixty-nine percent who have driven or ridden in a private vehicle recall seeing a roadside billboard in the past month, while 60 percent recall seeing one in the past week. The numbers for digital billboards are a bit lower, with 44 percent saying they recall seeing one in the past month and 32 percent recalling one in the past week. Out-of-home is one of the only media where digital is fueling growth rather than siphoning away eyeballs and ad dollars. Through 2018 global out-of-home advertising revenue will grow at a compound annual growth rate (CAGR) of 4.7 percent, while digital out-of-home will grow at a CAGR of 16.2 percent, according to a forecast from PricewaterhouseCoopers. 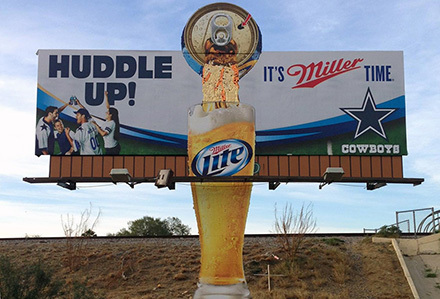 The global OOH market will reach $44 billion by 2018, with the U.S., China and the UK the markets leading the growth. The forecast says growth will be fueled by infrastructure expansion and the benefits offered by digital OOH. It also says that with the rise in popularity of smartphones, digital billboards have the potential to evolve from simply brand building to a point of sale. Anyone who buys out-of-home media knows that signage regulations vary state-to-state, and sometimes market-to-market. What’s surprising is that there’s not as much regulation as you might think. The Federal Highway Administration’s Office of Real Estate Services recently conducted a survey of the outdoor advertising practices among the various states, and found that 69.2 percent of states issue signage permits based on sign location. Other tidbits from the study: Just 28 percent of states said they require a business to be licensed before issuing a sign permit, while 72 percent of states do not. Also, 77 percent of states conduct regularly scheduled sign inventories, while 23 percent do not. OOH’s share of ad spend lags in the U.S. While out-of-home is the rare traditional medium to grow, it’s among the smallest media segments in the U.S., and its market share here is lower than it is worldwide. That’s according to the latest research from ZenithOptimedia, which found out-of-home and cinema advertising combined for 5.2 percent of total ad spending in the U.S. in 2013 (4.7 percent for OOH, 0.5 percent for cinema). Meanwhile out-of-home/cinema accounted for 7.5 percent of ad spending globally (6.9 percent for OOH, 0.6 percent for cinema). That could signal an opportunity for growth for the U.S. OOH market, and ZenithOptimedia does predict the medium will continue to rise here. The company projects U.S. OOH spending will hit $8.27 billion in 2014, growing to $9.11 billion by 2016. Lamar Advertising and Guthrie Green are bringing Tulsa’s first-ever photo-interactive digital billboard campaign to life. 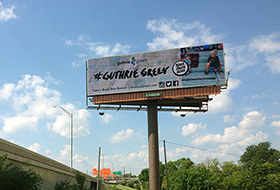 The campaign combines social media and digital out-of-home to provide an integrated consumer experience: select photos taken at the park and shared on social media with the hashtag #GuthrieGreen may appear on digital billboards in Tulsa, OK.
Lamar Advertising Company's bus shelters have a key role in a Highmark marketing push. 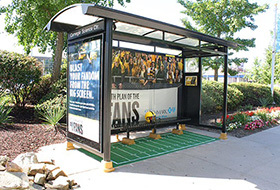 The downtown Pittsburgh-based health insurer unveiled a North Side bus shelter that has been decked out for the football season.